I came across Calligraphy & Sequins a while ago on Instagram and have always admired the details in each beautifully painted piece. So when I asked if there were any businesses out there that would like to be featured on my blog, I was pleasantly surprised to find that an email from C&S had dropped into my inbox. 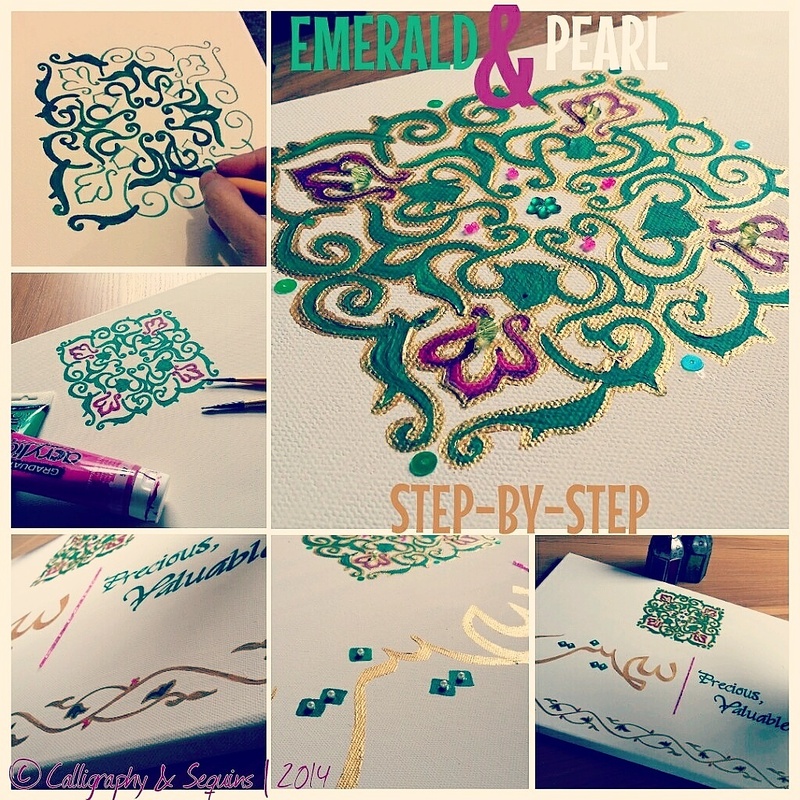 I had the amazing opportunity to interview Sahnia and learn more about Calligraphy & Sequins. Calligraphy & Sequins brings you Islamic Art with a difference- bold colours and bold pattern set out to redefine Islamic Art as we know it. The combination of contemporary design and traditional calligraphy, embellished beautifully, gives you unique and beautiful artwork with a timeless effect. 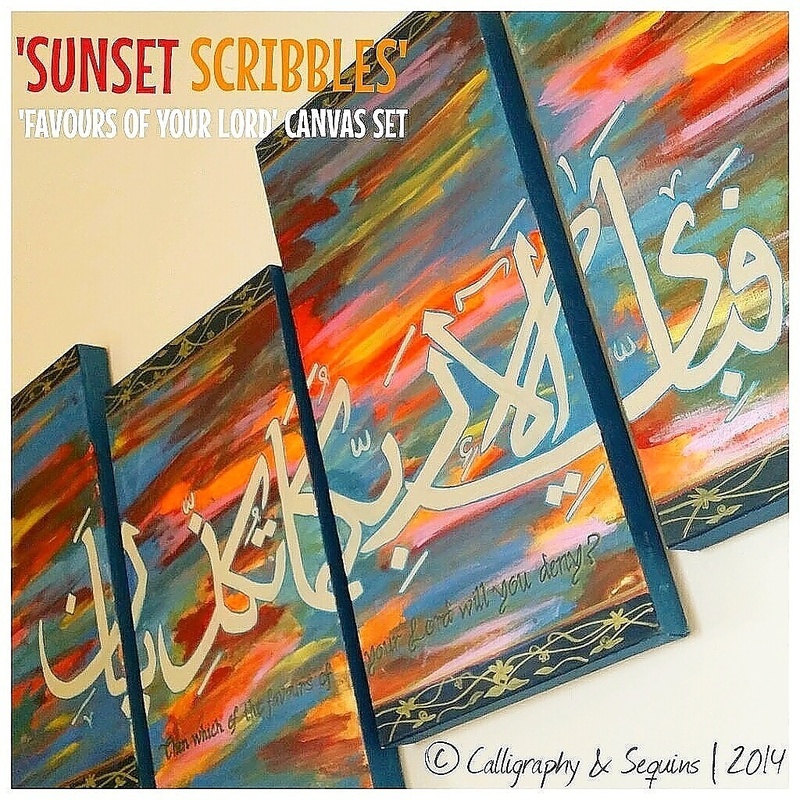 Founded by Sahnia Hussain, a self-taught female artist who likes to experiment with different calligraphy styles, using a range of materials. Calligraphy & Sequins remained mainly a concept for a long time. I felt there was a market for unique, bold and bespoke art that would beautify and personalise any home. 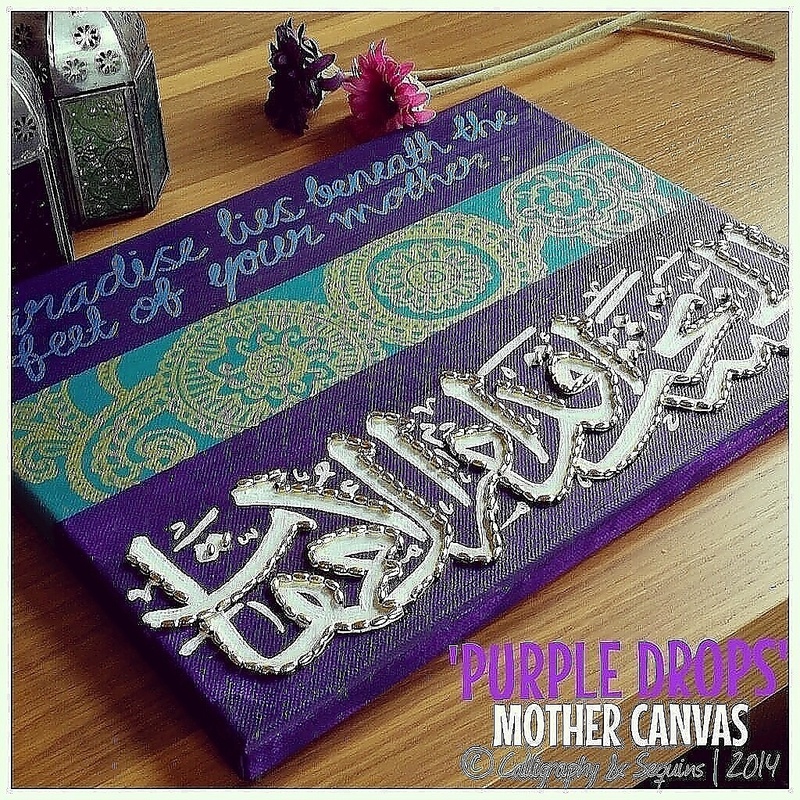 I had a desire to create Islamic art that was different; bright and blingy! Colour is an important factor in my work; it is all around us - in nature, food, clothing, architecture but I felt the Islamic art available to buy was sometimes limited in design and certainly in colour. Islamic art is a statement in itself and should therefore stand out in our homes which is why I like to work with bold colours and pattern; art should beautify, remind and inspire. This is what I aim to do with my work, and I pray insha'Allah others can gain inspiration through my art. What's the biggest challenge of owning your own business? I'm a mother of three, so juggling work and kids at home can be hard work; finishing off one project when you have a 'brilliant idea' for another is always a real test! But ultimately the biggest challenge is keeping things running smoothly with poor health. I have a hip and back condition (FAI - Femoroacetabular Impingement) which effects my mobility and can not always predict how bad a day it will be with regards to pain. While this can bring up some problems, I also see it as a blessing as I truly believe I would not have been able to give Calligraphy & Sequins the time and effort it needs in normal circumstances. And Allah knows best. While finding the balance between children, inspiration and health is sometimes tricky, I wouldn't change what I do for anything. I find inspiration in so many things, from an embroidered cushion to stunning mosques from around the world. I love all Islamic architecture, in particular from the Mughal era; I love the vibrant colours stemming from my South Asian culture and heritage and like to bring this out in my art. What's been the most rewarding part of this journey? Alhumdulillah, knowing that people appreciate my work and the love and support I have received from them and fellow artists is a blessing. There are so many talented artists out there, and I do not take for granted that a person chooses to have one of Calligraphy & Sequins' pieces in their home. It is a privilege to be a given this responsibility, and I take the utmost care to work with my clients to create perfect pieces of art that they desire. What does the future hold for Calligraphy & Sequins? We are hoping to have a website up and running in the very foreseeable future, insha'Allah. I really hope people will continue to appreciate my work and start recognising it as a Calligraphy & Sequins upon sight. I look forward to better health and bigger projects, insha'Allah. I loved getting to share with you more about Calligraphy & Sequins. Having tried my hand at drawing a couple of days ago, I know first hand how much time and effort it takes to produce a beautifully painted piece from start to finish. And so I have the utmost respect for Sahnia, who not only is a true inspiration but also a very talented and creative artist too.